Father, Son, & Holy Spirit! Trinity Sunday! 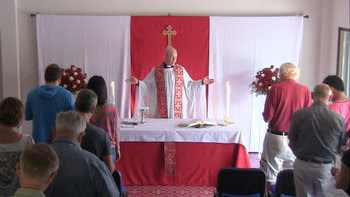 We had a wonderful service last week to celebrate the Feast of Pentecost, with nearly forty people in attendance. Most stayed to share the potluck afterwards. 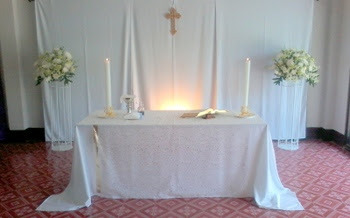 Special thanks to Alan and Tom who, as well as providing the beautiful flowers, also made our new red altar hangings. On Tuesday I had my commissioning service at McGilvary College, and it was great to have some people from All Saints there to support me. 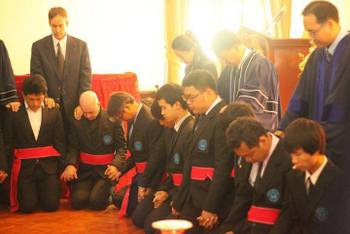 It was a long, but good, time of worship and dedication to service. Then on Wednesday night we had our first ever Church Council Meeting. It was a very positive gathering and we are excited about all the things God has been doing, and we believe will continue to do, amongst us at All Saints. Special dates for your diaries will be given soon! This week is Trinity Sunday and we welcome Father Ian to preach and lead our worship. Our readings will be Isaiah 6:1-8, Romans 8:12-17, and John 3:1-17, and we will be singing the hymns Holy, Holy, Holy, We all believe in One True God, I am the Bread of Life, and Mine Eyes have seen the Glory. The readings can be found via this link! Last Friday we said goodbye to Jacob and Kelly as they set off back to Afghanistan. The rest of us continue our generally easy lives in Chiang Mai. 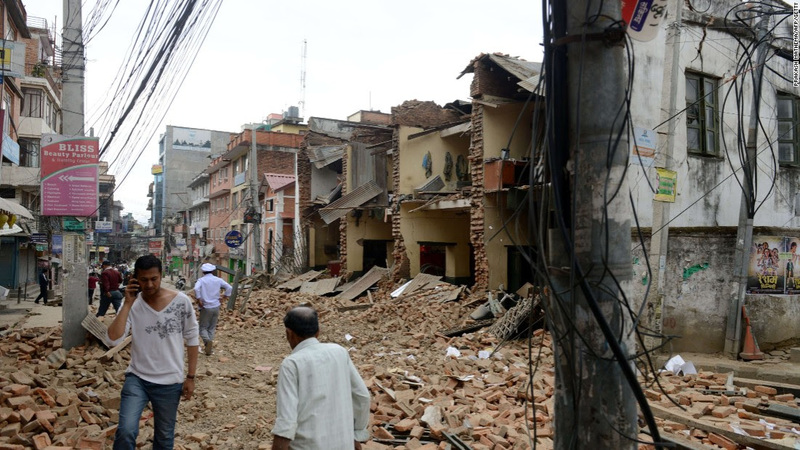 Meanwhile, we have all seen the terrible devastation caused by the earthquake which hit Nepal just over a week ago. With this in mind, this week’s offering will all be sent to support the relief efforts in that country via the UK Disaster Emergency Committee which coordinates the work of major charities and NGOs. Please come prepared to give generously. You can also give directly using PayPal or credit cards via the link above. Life continues to go on at All Saints, and we saw five new people last Sunday. Welcome! Please remember that this is the last week you can hand in nominations for the Church Council or fill in the directory form. Thanks to Alan and Tom who have started providing beautiful flowers to aid our worship each week, and to Elsie and Wim who are always ready to stand-in in the kitchen. The list of this week’s Lay Ministers is at the bottom of this email. Please check your name and let Elena know if you cannot be there. This week our readings will be Acts 10:44-48, 1 John 5:1-6, and John 15:9-17, and we will be singing the hymns Alleluia Sing to Jesus, Amazing Grace, Called as Partners in Christ’s Service, and All my Hope on God is Founded. The readings can be found via this link! Our sermon will be entitled Grace and Love!